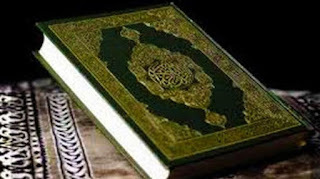 Few know that the sacred word “qur’an” is ÎµÎ»Î»Î·Î½Î¹ÎºÏŒÏ„Î±Ï„Î· and homeric*. It comes from the sacred Greek verb “ÎºÎ¿ÏÎ­Ï‰”, which means seed -the Word of God!- and, by extension, “scanning”. The verb “ÎºÎ¿ÏÎ­Ï‰” expresses the sacred act of creation: when our father “ÎµÎºÏŒÏÎµÏ…ÏƒÎµ”, that sowed the seed of the daughter-mother us and molded us! The “qur’an” has 114 “Chapters” (the corresponding “Arabic” word “Surah” is Greek, from the “Series”). And the name “Muhammad” is a loan from Greek “Î¼ÎµÎ³Î¬Î¸Ï…Î¼Î¿Ï‚” = being rich world of the soul. How gross is the water of the pool?